I made a salad. It was kale, these cool blond lentils I saw at the store, celery, red onion, hazelnuts, a mountain of manchego, and a spicy dressing of piri piri oil + hazelnut oil + sherry vinegar. 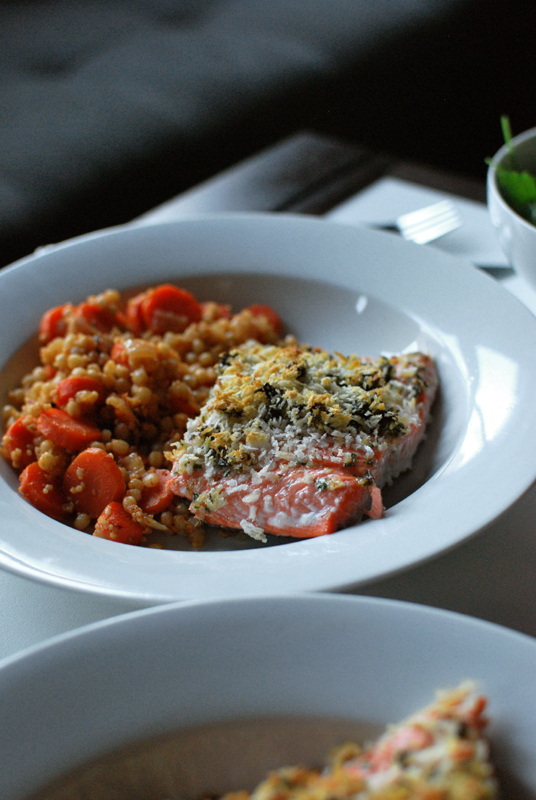 For dinner: coho salmon with oregano pesto breadcrumbs that aren’t browned enough. Boring. 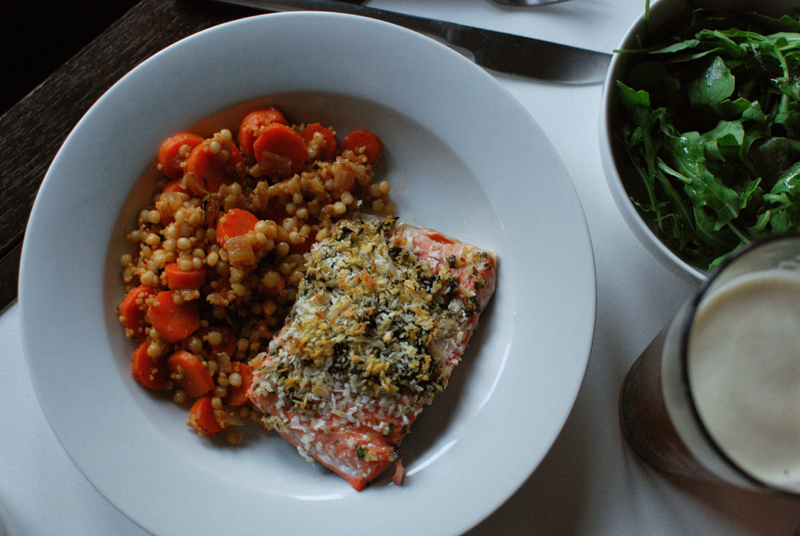 Alongside: Ottolenghi’s Spicy Carrot Salad, with couscous mixed in (regular and Israeli, because Ottolenghi). I finally broke down and bought myself Yotam Ottolenghi’s latest book, Jerusalem. I got all starry-eyed over the first recipe I looked at: a recipe in the way, way back of the book, with all the other weird sub-recipes you need to make half the items in the book. It’s a spice paste called pilpelchuma, and involves a quarter cup each (each!) of cayenne and paprika, along with 20 cloves of garlic. Y’all, it is intense. 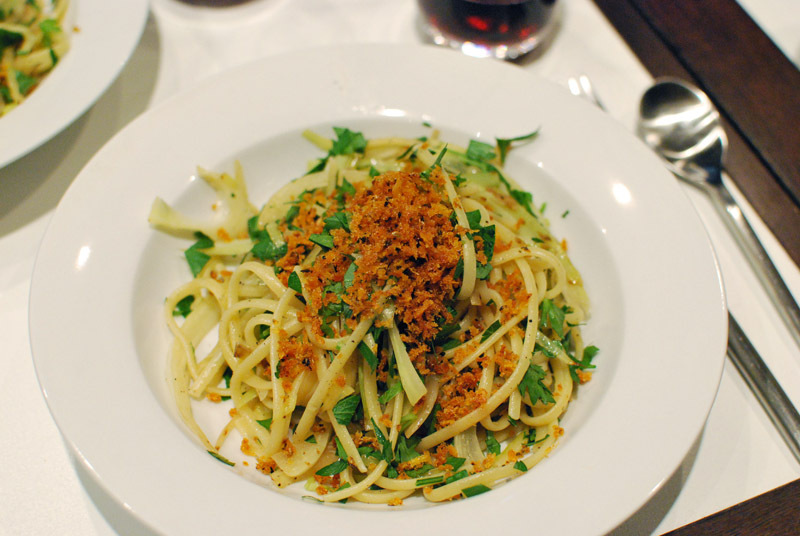 This Spicy Carrot Salad uses a single tablespoon of this spice paste. (Someone posted the recipe here, which uses the suggested double amount of harissa instead of pilpelchuma.) With the couscous, I got about 7 servings out of that salad, and the spice level was not messing around. From one tablespoon. You will see more of pilpelchuma. 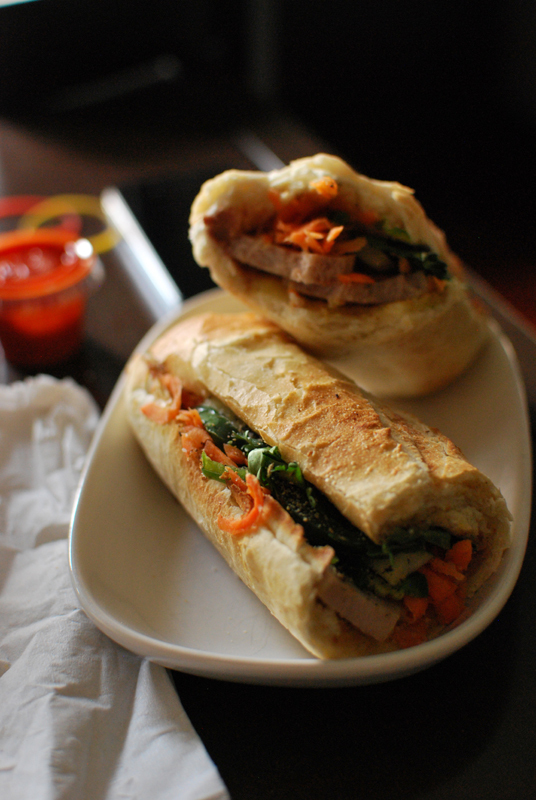 Lunch today: a bahn mi with pork and pâté, from a local place. Enjoyable, but just okay. 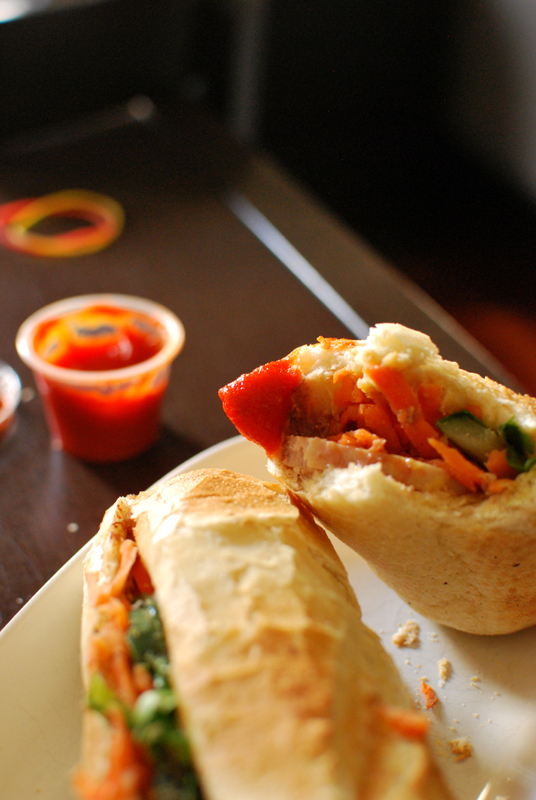 Not the best bahn mi ever. 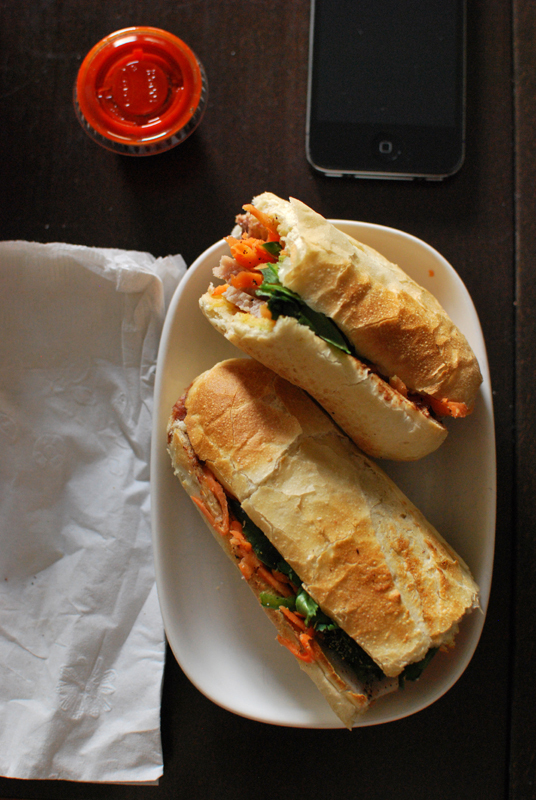 But I don’t think there exists such a thing as a bad bahn mi. Hipster ketchup on the side. 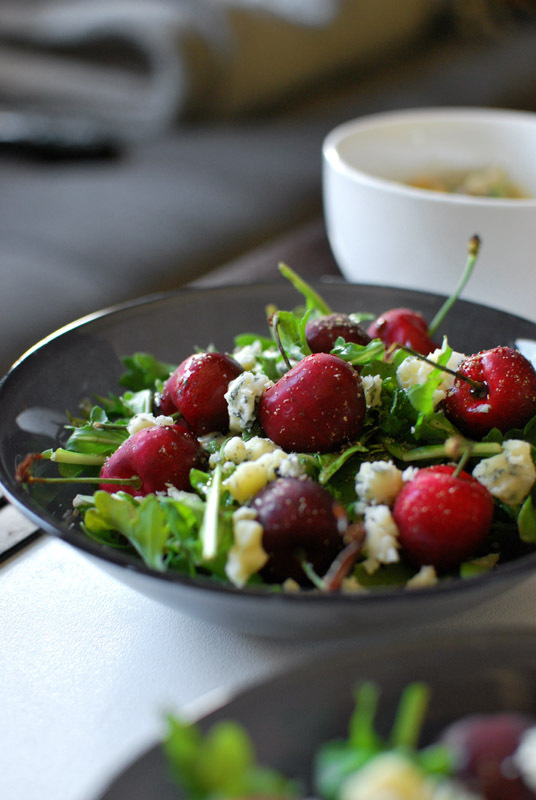 Two recent dishes: first, a little salad of arugula, fresh cherries, and some fancy-pants blue cheese. Lots of black pepper. Looks like I served it with some soup or whatever. Such a lazy salad. I couldn’t be bothered to pit the cherries, so I went full-lazy and left the stems on too. 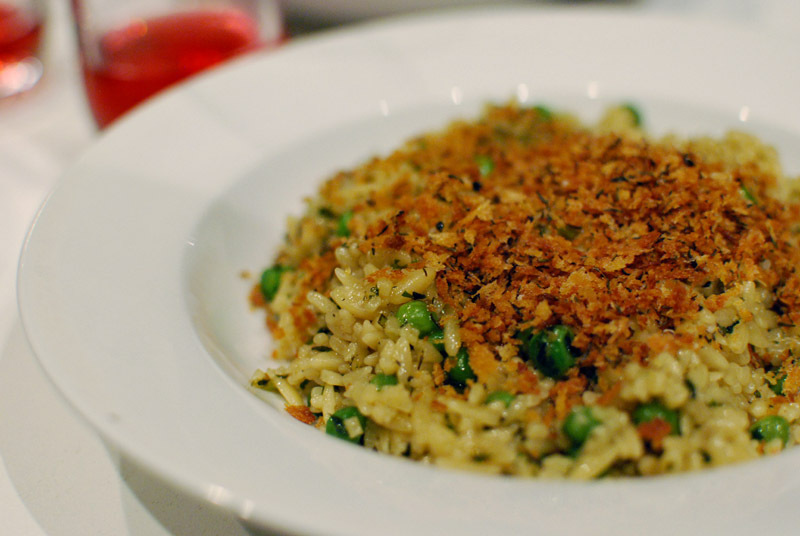 Second, orzo with peas, cooked mostly in the style of Frank Restaurant’s Spaghetti Limone. Thing is, I had some action left over from cooking chicken recently, in the form of chicken drippings (schmaltz and jus, mind) infused with fresh herbs. So I went ahead and used that instead of the cold butter indicated in the recipe. 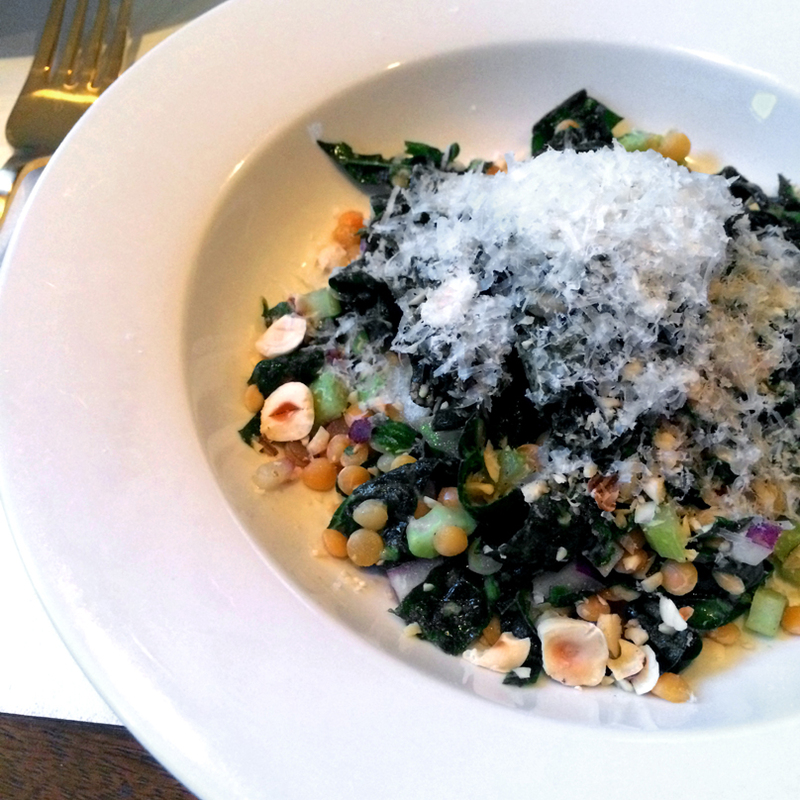 Added some grated Parmesan too, just before stirring, for an extra-luxe sauce. 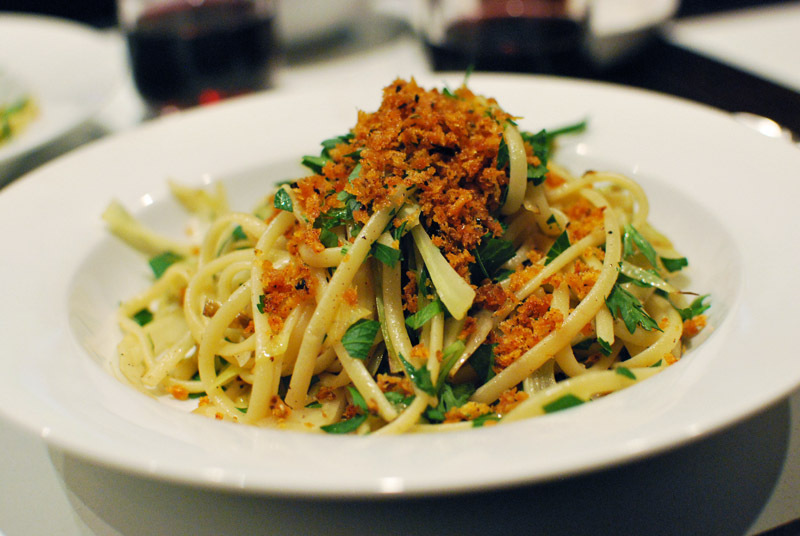 Toasty breadcrumbs on top because crunchy is the best texture. 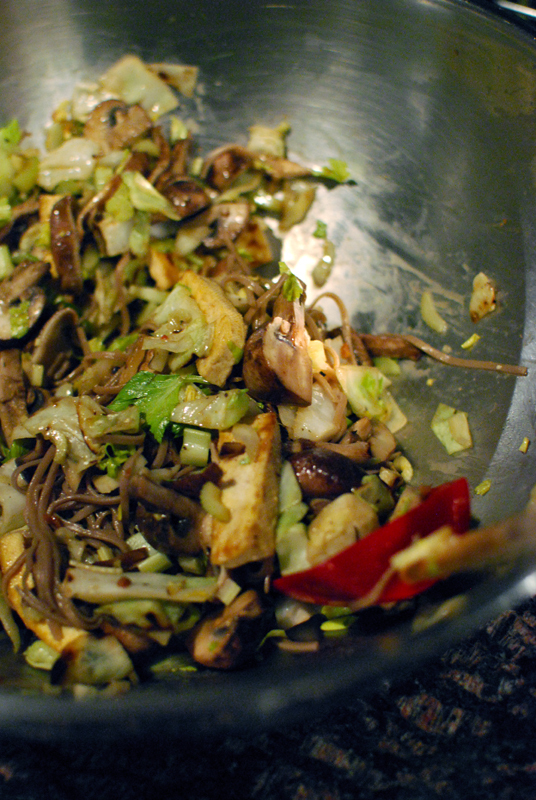 First, some Sesame Noodles with Chili and Scallion. 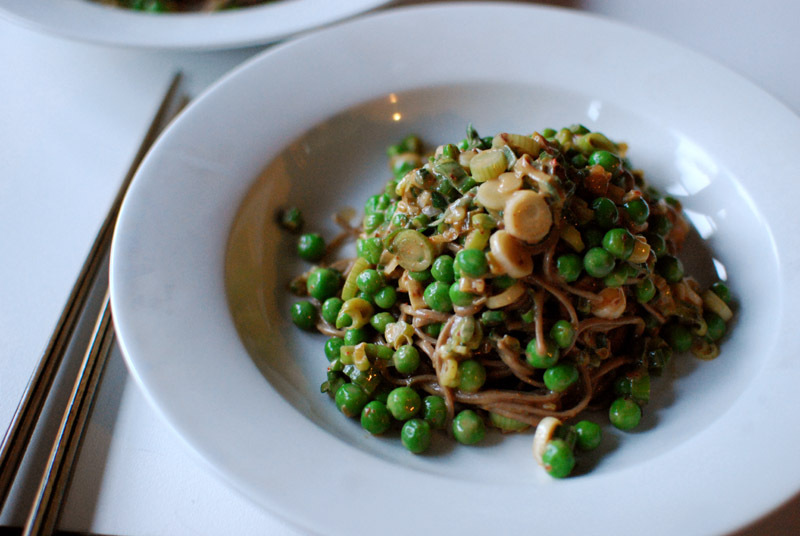 This is one of my new favorite recipes. 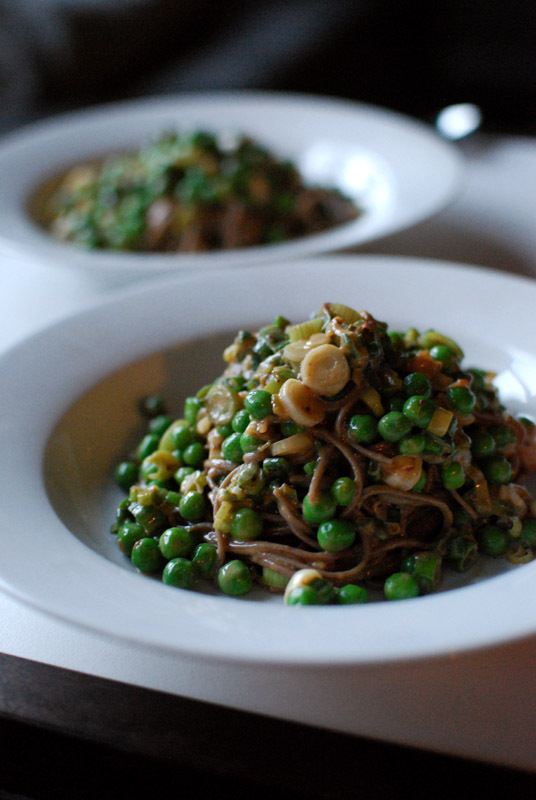 I added peas because, hey, peas. 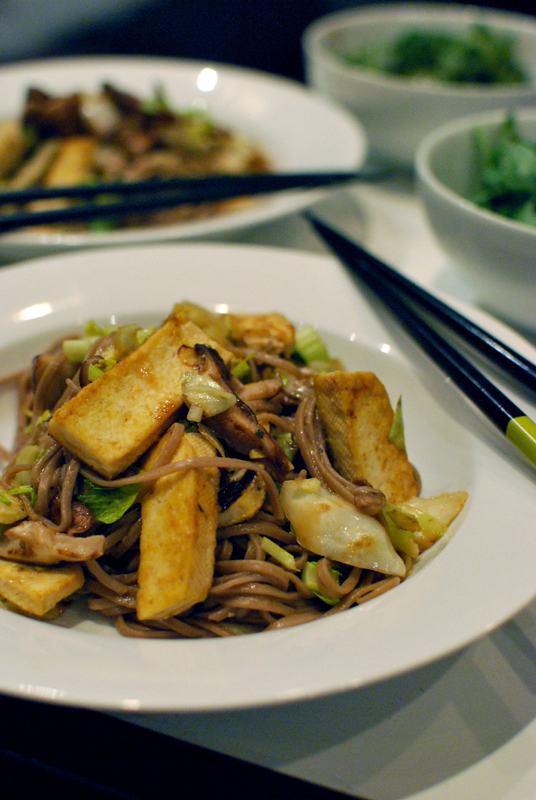 Also appearing are soba noodles, because soba + sesame = luuurve. I’ve made this with shrimp added to the mix which is also luuurvely. 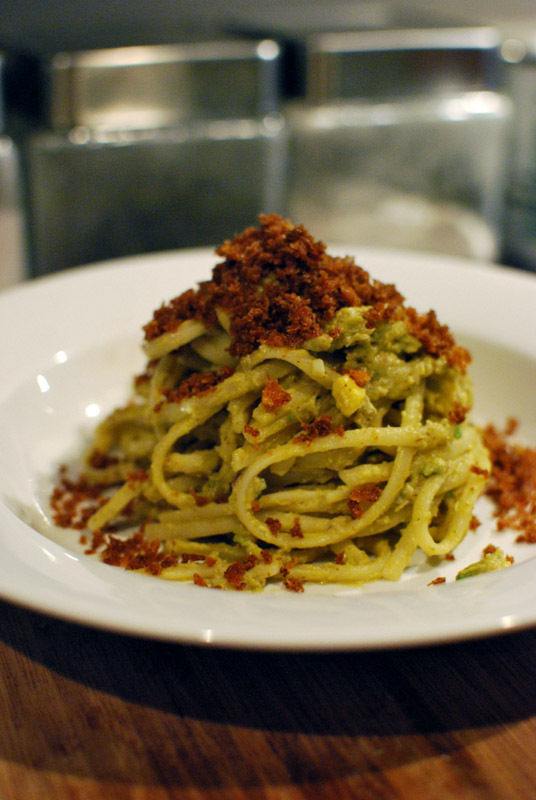 This dish could not be simpler. And oh my goodness is it fantastic. 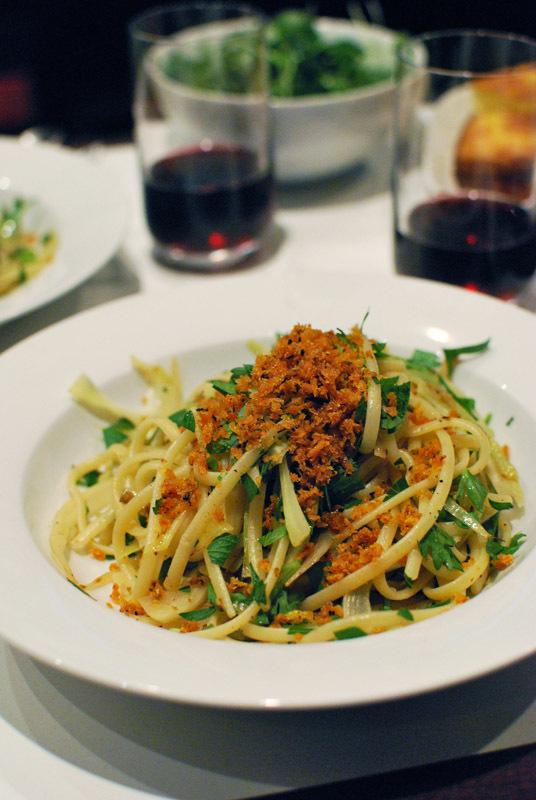 I added a small mountain of parsley and pecorino romano on top. Totally unnecessary, but totally awesome all the same. Last year, it was more green. I do not know why. 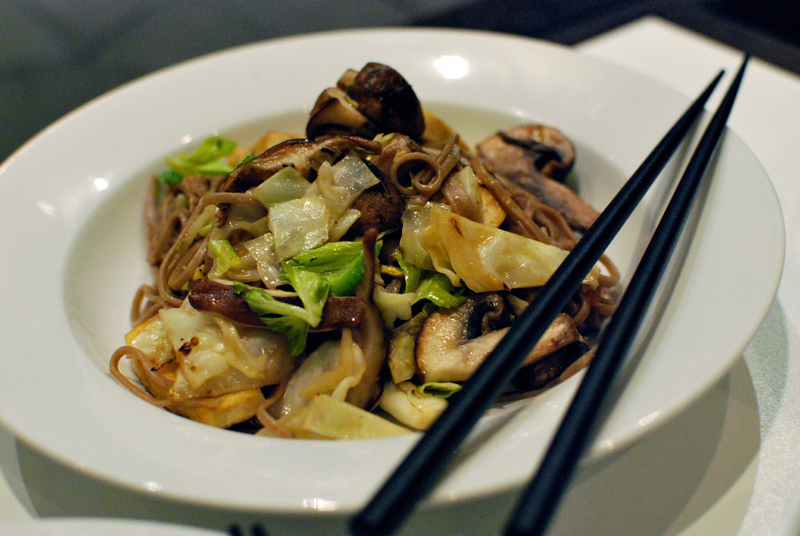 This year, I made it twice; one time with soba noodles instead of traditional pasta. So freakin’ good. 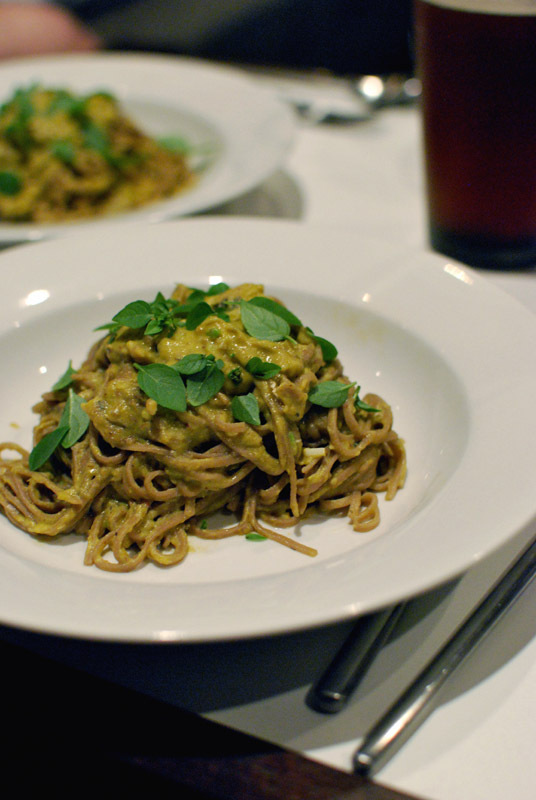 Recipe is here, if you like. 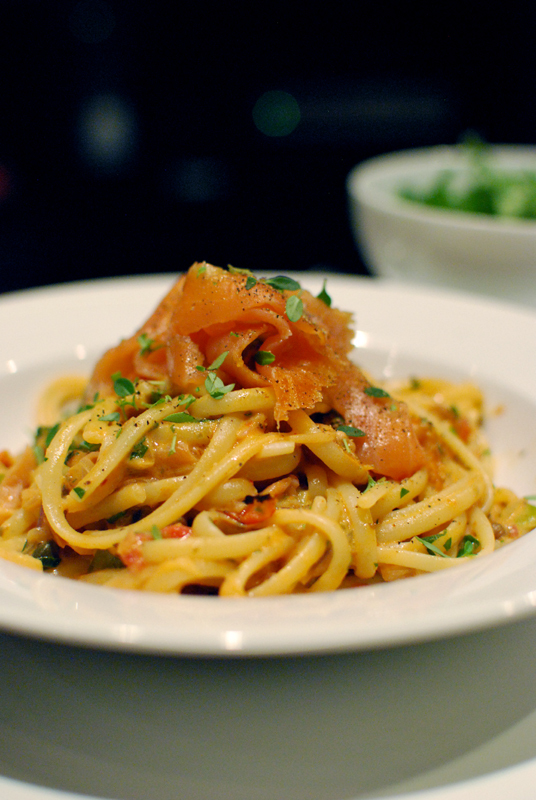 Two recent dinners: linguine and smoked salmon in an ersatz alla vodka sauce. I didn’t have onions or fish stock, but I did have the dregs left over from a huge batch of Pickled Shrimp. That, reduced with some tomatoes, a heavy pour of vodka, and a splash of cream, made an incredible sauce. 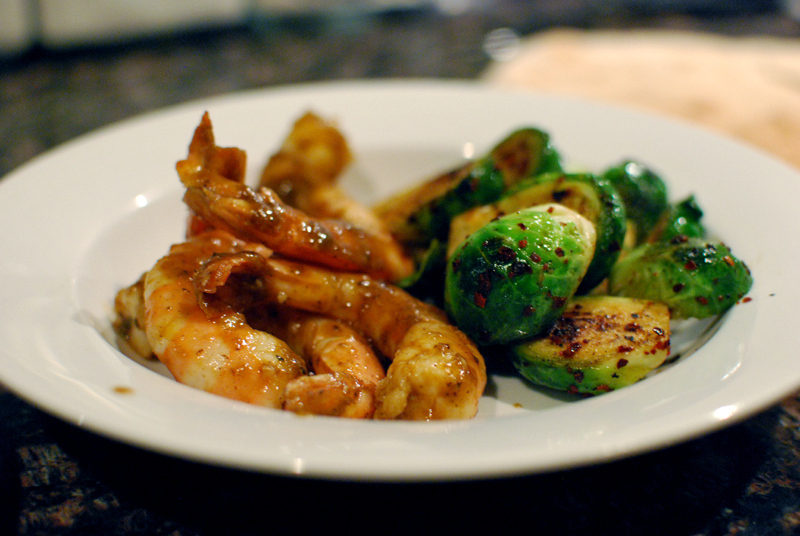 Then, a simple sautéed shrimp coated in some homemade glace, with gochugaru Brussels sprouts. Simple and lovely. Man, I freakin’ love seafood. I could eat my weight in seafood. 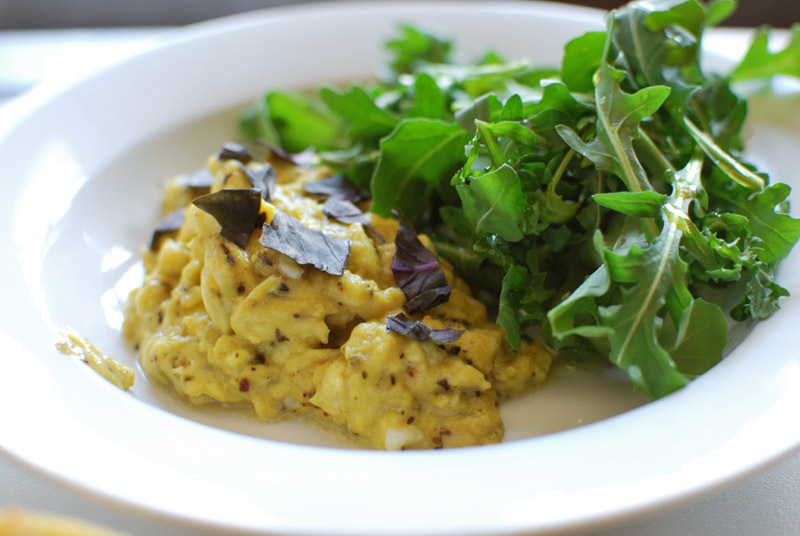 A recent breakfast of eggs, slowly scrambled in leftover beef fat and butter, with Herbes de Provence mixed in. 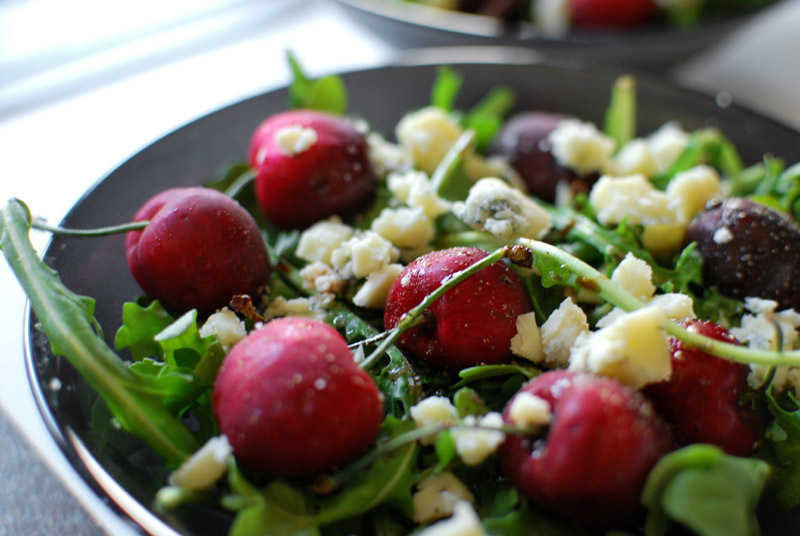 Arugula with olive oil and smoked salt on the side. 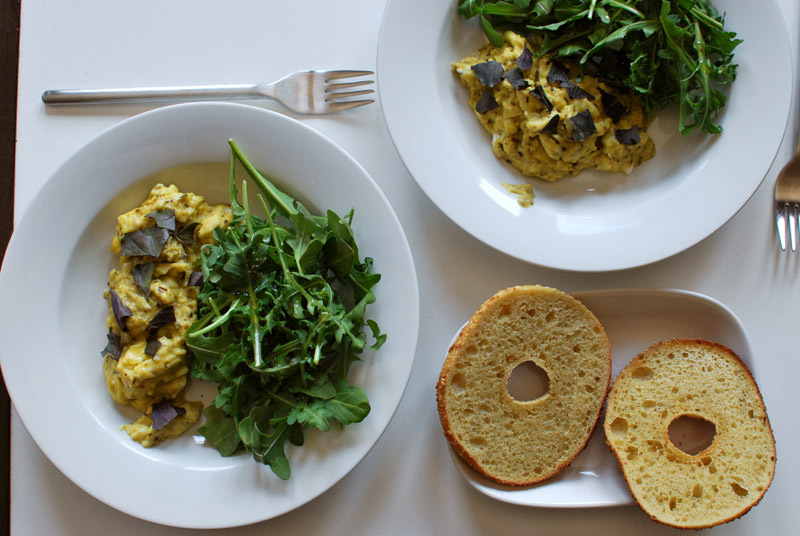 Nothing better than really, really slowly scrambled eggs. They’re flat-out creamy. These incredible bagels are from a new place in town. They’re exactly the kind of bagel I want to eat for the rest of my life. I mean, look at that crumb structure. 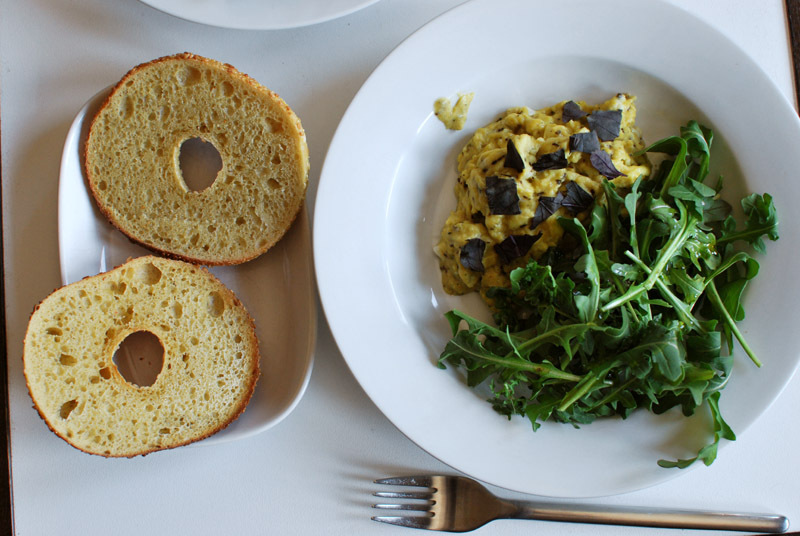 The flavor is complex and wheaty, not dense and bland like every other bagel you’ve ever had. 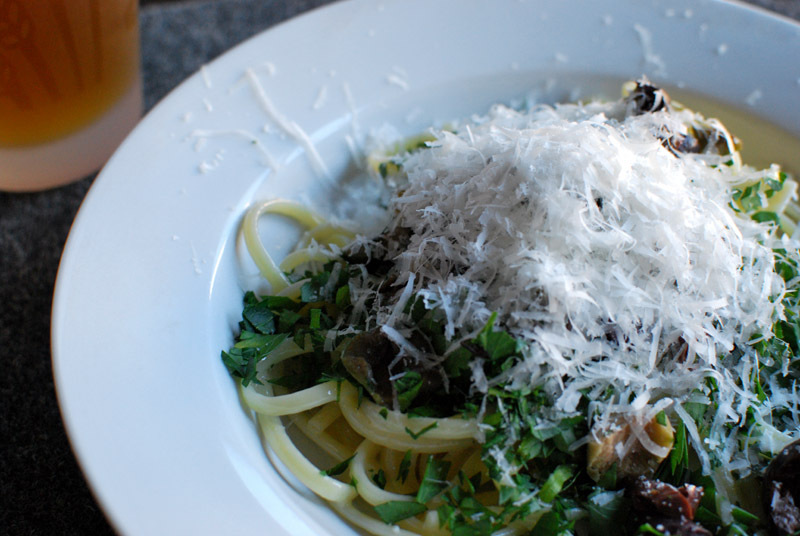 Cabbage is a highly underrated vegetable. It’s not glamorous or trendy. And isn’t that strange to think about? Vegetables being trendy? But look at kale and Little Gem lettuce. It happens. 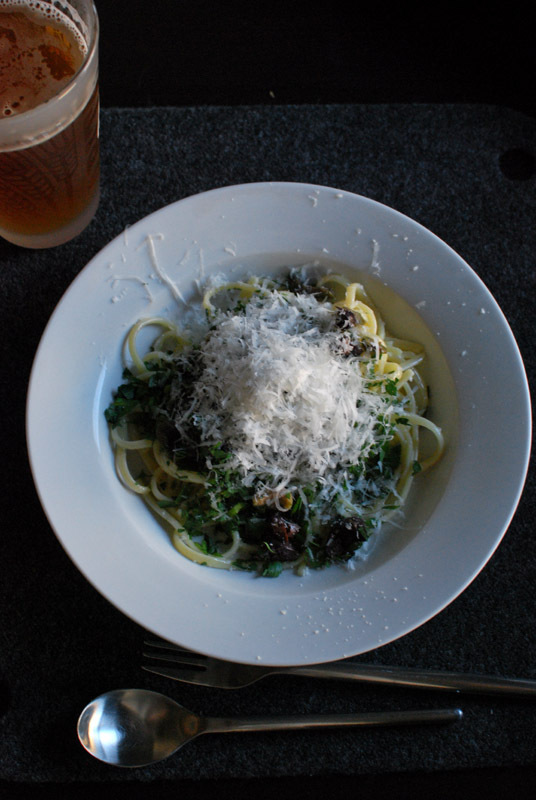 This is a decidedly glamorous presentation of cabbage: shaved thin, sautéed in bacon fat and olive oil with plenty of black pepper, tossed with al dente pasta and chopped fresh herbs (probably just parsley, but who can remember these things). Tarted up on top with some paprika-toasted panko. And hey hey, I made hummus too. This always happens: I make a thing for a client, and then I have to have it at home. 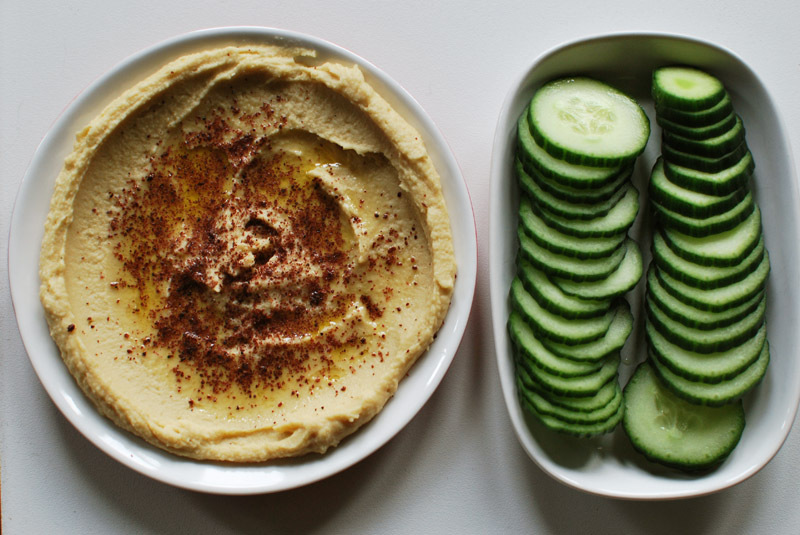 Hummus is best served spread thinly on a plate and topped with sumac and olive oil. Cucumber slices are optional; you can just eat it with your fingers in a pinch.